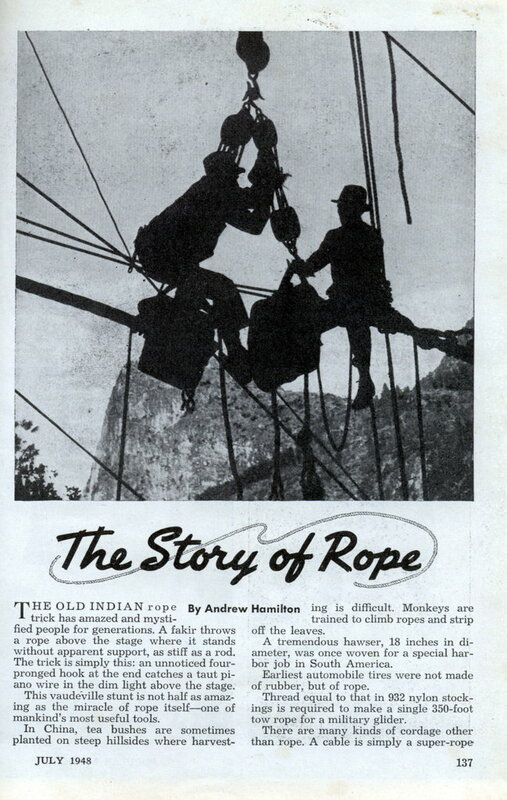 THE OLD INDIAN rope trick has amazed and mystified people for generations. A fakir throws a rope above the stage where it stands without apparent support, as stiff as a rod. The trick is simply this: an unnoticed four-pronged hook at the end catches a taut piano wire in the dim light above the stage. This vaudeville stunt is not half as amazing as the miracle of rope itselfâ€”one of mankind’s most useful tools. In China, tea bushes are sometimes planted on steep hillsides where harvesting is difficult. Monkeys are trained to climb ropes and strip off the leaves. A tremendous hawser, 18 inches in diameter, was once woven for a special harbor job in South America. Earliest automobile tires were not made of rubber, but of rope. Thread equal to that in 932 nylon stockings is required to make a single 350-foot tow rope for a military glider. There are many kinds of cordage other than rope. A cable is simply a super-rope in which ordinary rope is used as the component strands. Twine is two or more yarns, twisted together. Rope is one of the oldest devices for lightening back-breaking work. Anthropologists say that our caveman ancestors probably used it even before they invented fire, the ax or the wheel. Today, cordage-making in the United States is a giant and far-flung industry. Before World War II a score or more hard-fiber cordage and twine manufacturers were producing approximately 350,000,000 pounds a year. Wartime demands stepped this up to 600,000,000 pounds by 1945. Now production has leveled off at about the prewar figures. Best material for making strong, long-lasting rope is abaca, commonly known as Manila fiber. This is a fiber from a tree, botanically the same as the banana. Other fibers, not quite as good as Manila, are sisal from the Dutch East Indies, Africa and Haiti, and henequen from Cuba and Mexico. Materials used to make ropes for special purposes are: cotton, jute, flax, strips of leather and, newest of all, nylon. In rope-making there are four steps: preparing the fiber; spinning the yarn; forming the strand; and laying the rope. When bales of fiber arrive at the mill, they look like huge batches of blond hair. These fibers are scientifically blended and fed into the preparation machine. Thousands of small moving teeth comb, mix, overlap and parallel them into a continuous length of soft, silky “sliver.” Oilsâ€”animal and vegetable fats and waterproofing compounds â€” are added at this stage to make the rope water repellent, flexible, easy to handle and less likely to wear out by internal friction. In the second stage, the sliver is converted into yarn. Machines again comb the fiber, pass it through a funnel-shaped tube, twist it into yarn and wind it around a small capstan. From there it is wound on a large spool. Size and correct turn of the yarn are carefully regulated. Third step is forming the strand. A scientific formula determines the number of individual yarns that will make up the finished strand. Fourth and final step is laying the rope. A rope is usually formed of three or four strands. One of the chief problems of rope-making is to overcome the tendency for yarns to untwist. This is done by making the first twist when the fiber is spun into yarn from left to right. The second twist â€”from, right to leftâ€”is applied when the yarns form the strand. The third twist, when strands are laid to form rope, is again from left to right. The three twists counteract each other. About one third of all the rope manufactured in the United States is used for general marine purposes. Another third goes to industry and agriculture. The remaining third is used for making wire-rope centers, for commercial fishing, oil-well drilling and miscellaneous purposes. The Plymouth Cordage Company, one of America’s oldest and largest rope-makers, recommends 15 rules for the proper care of rope. Remove from coils properly. When taking the usual right-laid rope from the coil, make sure it unwinds in a direction opposite to clockwise. Lay coil flat on the floor with the inside end at the bottom. Pull end of rope through the center of coil. Store properly. A dry, unheated building, or a room with free air circulation is the best place to store rope. Dry after wetting, wet rope never should be storedâ€”make sure it is thoroughly dry before putting away. Keep it clean. If your rope gets dirty, wash with clean water and dry thoroughly before storing. Protect from chemicals. Keep rope away from storage batteries, paint, linseed oil, manure and fertilizer. Avoid kinks. If usage involves continual twisting in one direction, throw more turns into or out of the rope to avoid damage to rope structure. Don’t overload. With first-quality rope, it is safe to load up to one fifth the guaranteed minimum breaking strength. Slack off guys. When ropes are used as guy lines, and other supports exposed to weather, they should be slacked off to prevent overstrain due to shortening from wetting. Avoid sharp angles or bends. A sharp bend reduces tensile strength by putting extra strain on the outer fibers. Sheave right. You put unnecessary strain and friction load on a rope with sheaves that are too small. Reverse ends. When using rope as tackle, reverse the ends periodically. If a rope is damaged, cut and splice. Don’t lubricate. A well-made rope is already lubricated by the manufacturer and no additional lubrication is necessary. Avoid unnecessary wear and abrasion. 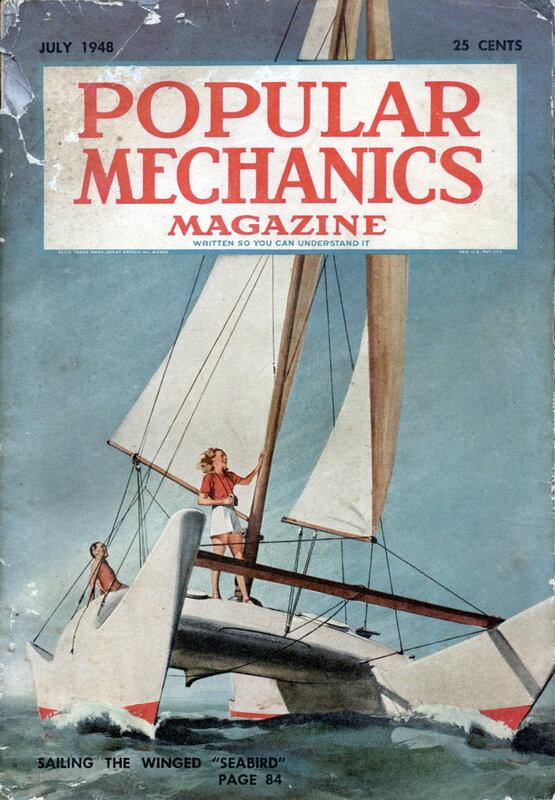 Surface wear may come from allowing one rope to chafe another. Splice correctly. Splices are better and stronger than knots, which reduce the strength of the rope up to 50 percent. Avoid sudden jerks or strains. A common piece of twine may be difficult to break with a steady pullâ€”yet it can be broken easily with a sharp snap. The same is true of ropes.